This sort of question is becoming more and more common as 64-bit software becomes more available, and 64-bit systems start becoming more prevalent. 64-bit systems are better than 32-bit ones and more of these will be available in the future, but in the meantime, you need to be aware of what you type of computer you have and what OS you are running. The easy way to find out is to check what version of Vista you are running. This comes preinstalled on your machine, so would be the right version for your machine. And finding out what this is is quite easy once you know how. Under the System section you can see a label called “System Type”. 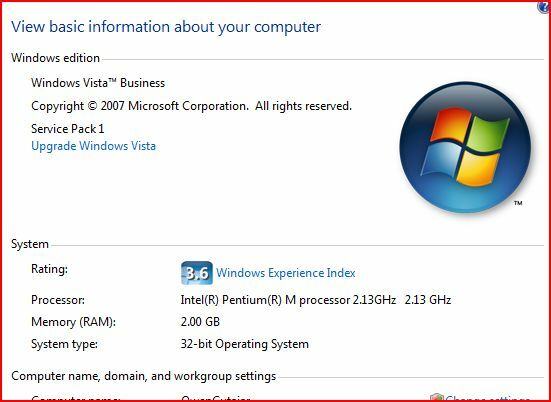 This tells you whether you’re running the 32-bit version of Vista or the 64-bit. As I said, once you know where to look it’s not hard to figure out what you’re using. At least, I find it less confusing than equestrian clothing (my wife was looking for something for her horse-riding and boy, do they have a range of products available). I didn’t even know where to start there! ← Previous Previous post: Is there an easy way to generate keywords for my website? Next → Next post: How can I reduce the bandwidth my website uses? I appreciate this explanation, but I have no “System” tab in my Computer-Properties window on Windows XP. I’m assuming XP predated 64-bit, so this is 32?